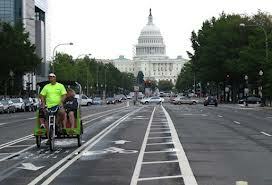 The joy of life atop two wheels is catching on in Washington D.C.! More of this = more Ladies! And who doesn’t want more Ladies? Recently released bike counts of 19 different locations around the capital showed a whopping 271% average increase in cyclists per hour. What lovely news! But guess what, Ladies? This bikey-‘splosion didn’t occur in a vacuum. Bright policy makers and planners (who I will assume are, clearly, Ladies) in D.C. decided to dramatically expanded their Lady-friendly infrastructure during the same time period. Yet again, IF YOU BUILD IT, THEY WILL RIDE. The city has also made it easier for bikers to get around in the past eight years. In 2004 the city had 14 miles of bike lanes. Today the city has 57 miles of bike lanes. The more respect shown to active transportation via smart planning and the more people are given viable options for commuting that don’t threaten life and limb, the more you will see lovely Ladies (and handsome Lady-lovers) beautifying city streets. The only issue with this ray of two-wheeled sunshine: the vast majority of the riders weren’t Ladies. A full 77% of riders were men. More Ladies riding tends to signify safer, lower-stress bikeways, so while D.C. is doing an amazing job, they still have a ways to go. And Ladies in D.C.: it’s time to make your fabulous selves seen! Get out there and check out the infrastructure for yourselves. Plan your trip ahead of time with this interactive bikeway map that shows bikeways and local bike shops. So get out there with the gentlemen of D.C. and enjoy your ride, Ladies!